Indiana University President Michael A. McRobbie addresses the IU Southeast graduating class of 2018. (NEW ALBANY, Ind. )—Indiana University Southeast conferred 961 degrees at its 50th Commencement on Monday at Freedom Hall in Louisville, Ky. The Class of 2018 consists of 943 candidates earning 854 bachelor’s degrees, 104 master’s degrees and three associate’s degrees. Thirty-one students walked across the stage with a perfect 4.0 grade point average. Hayley Love, who graduated with a Bachelor of Science in Nursing degree with minors in communication and psychology, delivered the class response. Love challenged her fellow graduates to test their abilities and stretch their limits, even when it means welcoming failure. “If you never learn how to fail, then you will fail to learn,” Love said. She urged them to maintain an empowering mindset, to transform anxiety and self-doubt into determination and accomplishment. The Class of 2018 ranges in age from 20 to 66, and hails from 33 Indiana counties, 11 U.S. states and 15 countries of origin. Thirty-five percent of these candidates became the first in their families to attain an undergraduate degree. The most popular degree to be granted Monday was the Bachelor of Arts, while the most popular major was the Bachelor of Science in Business. IU Southeast has awarded nearly 35,000 degrees over the past half century. Jerry Roby ’85, Grenadier basketball legend and businessman whose support has enabled scores of student-athletes to reach their full potential, received the 2018 IU Southeast Distinguished Alumni Award. Robert Lanum, attorney and former member of the Indiana University Foundation Board of Directors, as well as the IU Southeast Board of Advisors, whose philanthropic efforts have improved the quality of life in the region and the educational opportunities on campus, received the honorary Doctor of Human Letters degree. 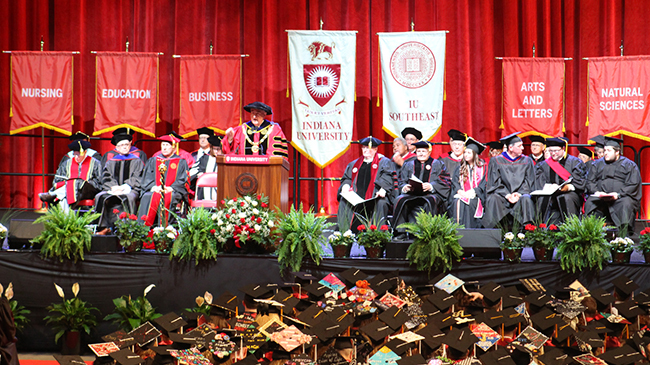 In concluding the ceremony, Indiana University President Michael A. McRobbie challenged the students to carry the benefits of an IU education into the world. “The reputation of Indiana University depends on your continued commitment to the values, knowledge and skills that you have learned here,” McRobbie said.